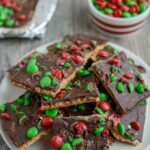 This Graham Cracker Toffee Squares recipe is a Christmas cookie tray staple! Everyone will love this classic dessert and it’s the perfect quick, easy holiday treat! It’s Friday! Let’s celebrate with some dessert, shall we? I’ve been making these Graham Cracker Toffee Squares for as long as I can remember. I even used to have the recipe on my blog back in the day. But the photos were so hideous that I actually unpublished it a few years ago when I was trying to clean up my site. Well, Christmas time is here again and since this is a staple part of my annual Christmas cookie tray, I figured it was about time to get the recipe back up on the blog so all of you can enjoy it as well. This dessert is really nothing new. I’m sure a lot of you have made your own versions but over the years I feel like I’ve perfected mine and it seemed like it was worth sharing! While I definitely wouldn’t call this healthy, it does use significantly less butter and sugar than most similar recipes and tastes just as good (in my opinion! I love topping mine with Christmas m&ms to make it festive but really you could top it with whatever you want. I think when my mom used to make it she would top it with slivered almonds and extra chocolate chips. If Squish had his way, ours would also have Christmas sprinkles on it. Speaking of Squish….this recipe is so easy even toddlers can make it! So you’ve got no excuse not to try. Line a foil-lined large rimmed baking sheet with sheets of graham crackers. Top with butter & sugar mixture and use a brush to coat all of the crackers. Bake at 350 for 8 mins. Remove from oven and sprinkle chocolate chips all over the top. 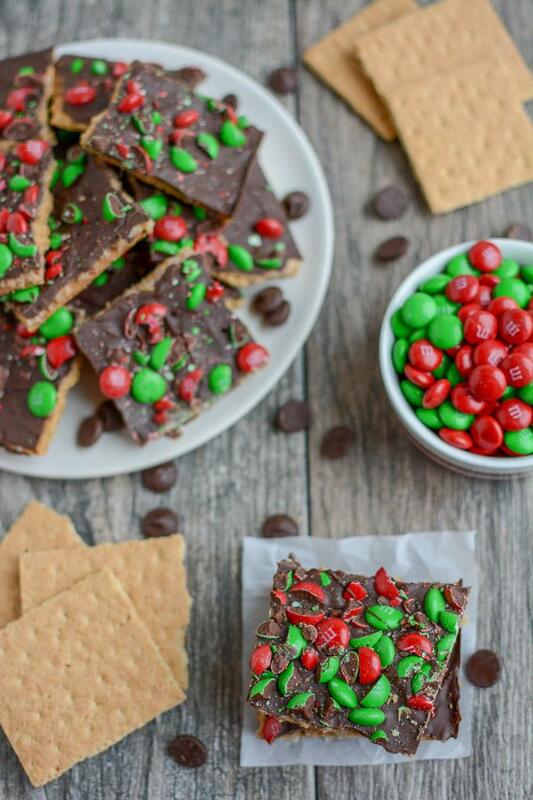 Remove from oven and spread melted chocolate chips into an even layer over top of crackers. 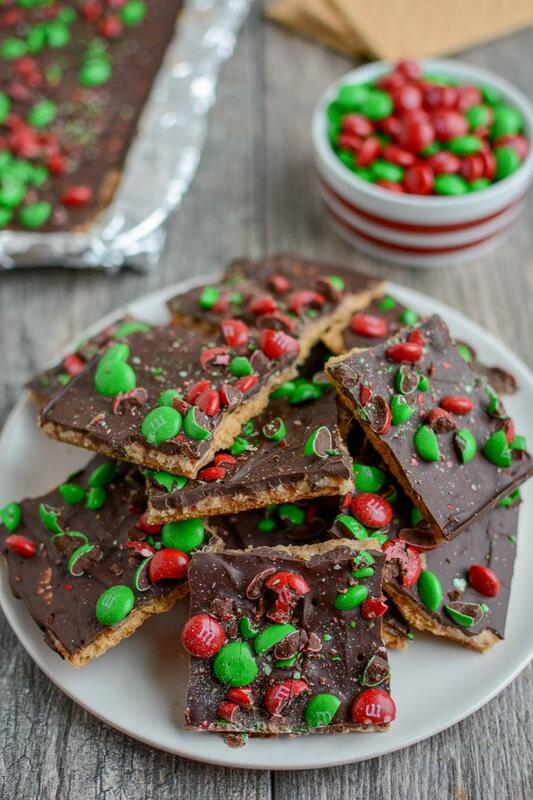 Sprinkle with extra toffee pieces and chopped m&ms. Let cool completely and break into squares. Try using different colors of candy to make this a treat for other holidays, too! Made these today at a cookie-baking party – they were a huge hit! I made one batch with milk chocolate since that’s my preference and another batch with semi-sweet since that’s what was on hand, but….both were delish! And so easy – thanks so much! I cannot stop eating this!!!! I made it for our Christmas party tomorrow but I may eat it all first 😉 Never made anything like this but was intrigued and it’s a keeper. Thanks for sharing and Merry Christmas!